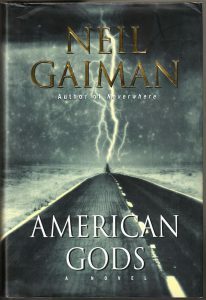 American Gods, by Neil Gaiman, is one of those books that my husband has always insisted I read, but that I’ve put off reading until now. Why am I reading it now? Because the TV show, starring Gillian Anderson and Ian McShane (among others), is set to debut in 2017, and I wanted to know the story before I watch the show. American Gods is the story of Shadow Moon. Sentenced to three years in prison for robbery, Shadow did his time, quietly waiting for the magic day when he could return to Eagle Point, Indiana. All he wanted was to be with Laura, the wife he deeply loved, and start a new life. But just days before his release, Laura and Shadow’s best friend are killed in an accident. With his life in pieces and nothing to keep him tethered, Shadow accepts a job from a beguiling stranger he meets on the way home, an enigmatic man who calls himself Mr. Wednesday. A trickster and rogue, Wednesday seems to know more about Shadow than Shadow does himself. Life as Wednesday’s bodyguard, driver, and errand boy is far more interesting and dangerous than Shadow ever imagined. It is a job that takes him on a dark and bizarre road trip and introduces him to a host of weird characters whose fates are somehow mysteriously intertwined with his own. Along the way, Shadow will learn that the past never dies; that everyone, including his beloved Laura, harbors secrets; and that dreams, totems, legends, and myths are more real than we know. Ultimately, he will discover that beneath the placid surface of everyday life, a storm is brewing, and that he is standing squarely in its path. I listened to the 10th Anniversary full-cast audio version of American Gods, and was completely drawn in from the very beginning of the author’s introduction. Neil Gaiman actually traveled the United States while writing this story, so that he could accurately describe Shadow’s road trip on paper. Gaiman’s masterful descriptions and the actor’s performances brought this story completely to life, and I highly recommend both the book and the audio version. This entry was posted in Books & Reading, General, Information Resources, Uncategorized and tagged Friday Reads. Bookmark the permalink.